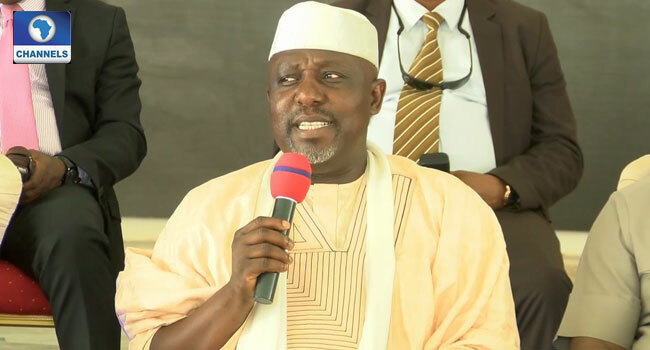 The Imo state Governor Rochas Okorocha has revealed plans to establish a special school for the blind and physically challenged in the state as a way of helping them get a more meaningful life. The Governor disclosed this at the Government House in Owerri the Imo state capital while receiving the Minister for State for Niger Delta Affairs, Professor Claudius Daramola, who was in the state to commission a Federal Government project. He also used the medium to appeal to the Federal Government through the Ministry of Niger Delta affairs to complete the long-abandoned Skills acquisition centre meant for the people of the oil-producing area of Imo state. In his remarks, the Minister disclosed that his mission to the state is to commission a palm oil processing plant in Ikeduru Local Government Area of the state a project completed by the Federal Government to boost agriculture in the country and serve as an alternative to oil dependency. Mr Daramola commended the state governor for his support and contribution to the development of the state and the Buhari led administration. In a similar development, while addressing the Batch A Stream 1 corps members at their passing out parade at the Heroes Square in Owerri the governor urged the graduands to ensure that they do not depend on white collar jobs but ensure that they become employers of labour. The governor approved the sum of N10, 000 each to the 1,542 Corpers who passed out and the sum of N200,000 for the best serving corper, Miss Umetawara Lorita Ebere and a job in any Ministry of her choice if she decides to stay back in Imo state. He said that his administration will continue to initiate programmes and policies that will be of great impact on the lives of indigenes of the state till the end of the administration.